This file is part of Tea Light Village, a series of 3 files that will create a tiny 3D village designed to fit over standard LED Tea Lights. This file contains the cutting files for the cottage, barn and two trees. The finished village makes a wonderful Christmas Village for a centerpiece or mantel display. It is an easy-to-do 3D project good for beginners (and experienced users) wanting to try 3D ideas. The file is both Cameo and Portrait friendly. 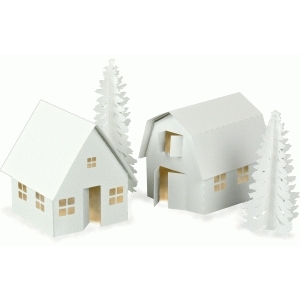 Construction directions and display ideas can be found at http://ashbeedesignsilhouette.blogspot.com/2013/11/tea-light-village-tutorial_10.html Be sure to also download 3D Tea Light Village Town House and Shop, and 3D Tea Light Village Church.